Last week I found myself with a couple of hours around town while waiting for another activity later in the evening. As usual, I tried to make the best of it while waiting, fishing out my trusty Leica and roaming the streets, trying to create new work. 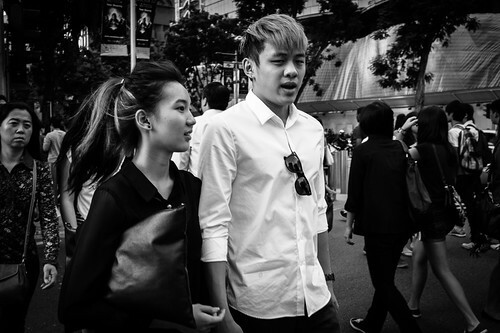 A trendy couple posing for the camera as they walked down Orchard Road. 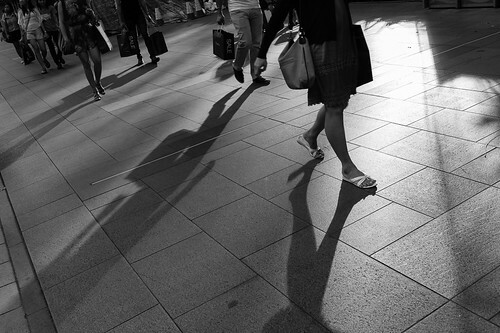 This is no Shibuya, but the crossings in Singapore have their own (local) flavor. 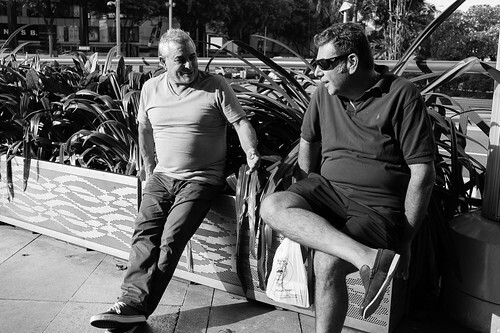 These guys are enjoying the evening sun as they chatted outside Ion Orchard. 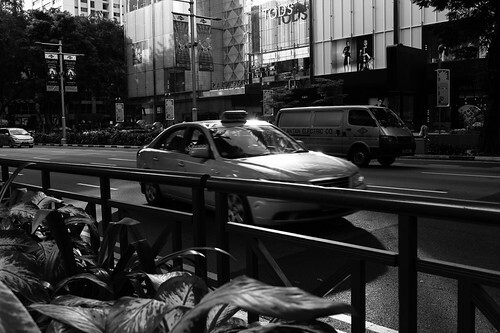 Orchard Road was where I started street photography many years ago – deeply etched in my memory are many shots which I still vividly remember seeing, and photographing, and many are the prints I recalled making, coming off rolls of negatives (I was shooting film then, mostly with a Leica M6). 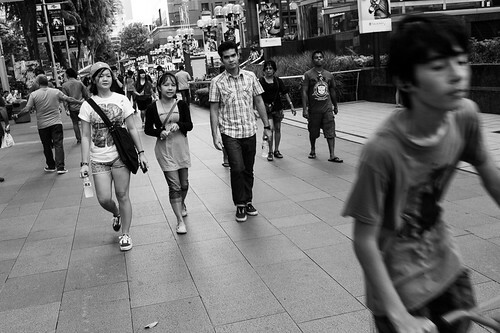 A stroll down Orchard Road. 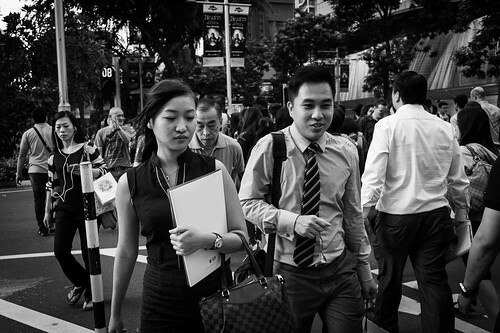 For the past few years I have however been unable to inspire myself sufficiently to create any meaningful new work from this part of Singapore – partly maybe I was a little jaded by the familiar confines of the place (even if much has changed since 2002 when I roamed Orchard Road extensively), partly because I have been seduced by the streets of other lands (particularly Paris and Japan). 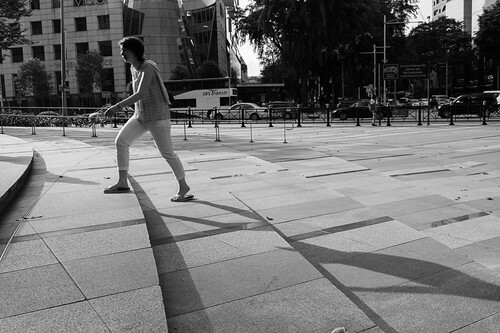 Taking the next step forward – outside Ion Orchard, Singapore. 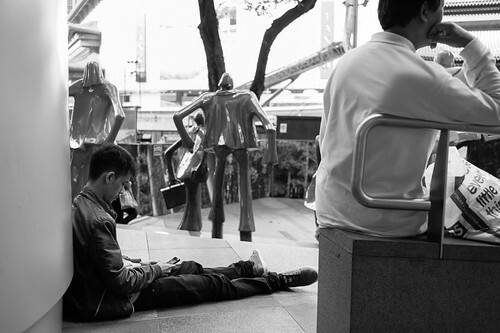 That day, I resolved in my heart to re-open my eyes to Orchard Road – all the pictures you see here are from that day in town. 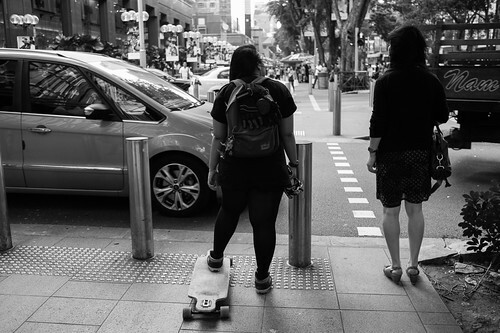 I can’t say it’s the best work I’ve ever done in Orchard Road, but it’s a start – a start to re-capturing some of the old emotions and moods I felt years ago walking down Orchard Road. 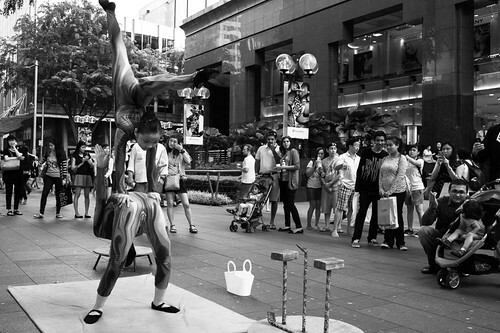 Street buskers outside Takashimaya, Orchard Road. True, it does not have that sense of grandeur as walking down say, Avenue des Champs-Élysées, nor the historical significance of roaming Place De La Concorde, nor do the street crossings feel like those in Shibuya, and certainly the buzz is no where compared to the streets of Shinjuku, but Singapore is my home, and it’s where I am based, and I want to see it with a renewed spirit, if not a pair of fresh eyes. 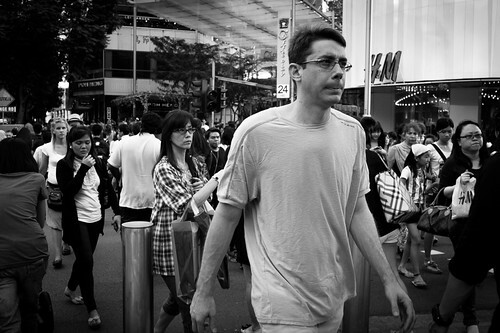 Man crossing over to Cineleisure, Singapore. 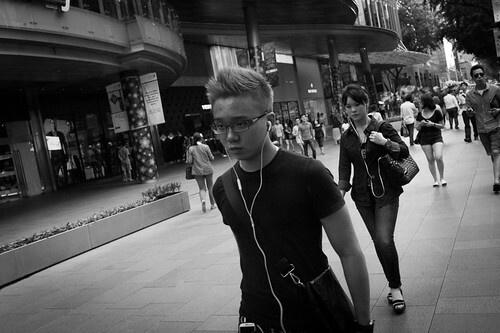 I will certainly be roaming Orchard Road again. And again….